Strained tendons in left wrist Recurring injury for 6 months Struggling to make any progress! My injury first came about after doing a couple of days work. I was lifting hundreds of office chairs, desktops & filing cabinets & after the first day, I woke up with a soreness down the outside of my left wrist. After seeing a physio I was told that I'd strained the tendons on the ulnar side of my wrist. I was surprised to injure my wrist as I play golf every day & also go to the gym regularly. I'd never experienced any sort of injury or anything at all from my wrists. I would also like to think that I'd built up a decent amount of strength in my wrists, arms & shoulders. After seeing the physio, I ended up taking just over two months away from golf & anything involving my upper body in the gym. After this time I was able to ease back into golf & within a few weeks I was back to playing full time. I carried on like this for about two months & didn't have any soreness or pain from the wrist at all. I began to feel that i could start doing some upper body work in the gym. I did about three or four sessions & did experience some soreness but I was expecting this as I hadn't used it in such a long time. Around the same time I was hitting balls as usual and it was 0 degrees, freezing. I mishit a shot, catching the mat before the ball & felt the pain down the left side of my wrist that I'd felt when I first injured it. It's been about two months since I re-injured it & I've had about a month of complete rest & have tried to practice a little bit every other day. Unfortunately the soreness will not go away. When I experience any soreness it's also on the inside of my left wrist & can spread up the outside of my left forearm. It sometimes feels like a burning sensation. When it does get irritated there is also a lot of grinding from the wrist. For the most part, when I'm just going about my everyday business, I don't feel much from the wrist except a bit of stiffness & a tightness down either side of the wrist. The soreness & feeling of inflammation only happens when I've been using it. I've been doing some basic stretching & strengthening exercises every day & have also been doing regular icing to try & reduce the inflammation. I've also been taking ibuprofen regularly to try & help. I'm not sure whether to consider more serious options such as a cortisone shot or maybe even surgery if the problem carries on. Please let me know if you can offer any advice! Surgery? Good lord, no James. Surgery for some soreness? Cutting into the flesh and causing injury for some soreness? No. What exactly would they do surgery on?? What you describe is the predictable mechanism of the Pain Causing Dynamic. In my book, 'injury' means that there's rip and tear. Irritation, or minor wear and tear damage, is not injury. It's irritation, and the body being stuck in a pain dynamic. As you've discovered, Rest does not fix Wrist Tendonitis. Anti-inflammatory drugs like Ibuprofen do not fix tendonitis. They're fine to get you through the day, but aren't a cure. You have pain because your muscles are too tight, thus aren't firing properly, connective tissue is too tight, chronic inflammation process, and very likely nutritional insufficiency/deficiency is playing a role. 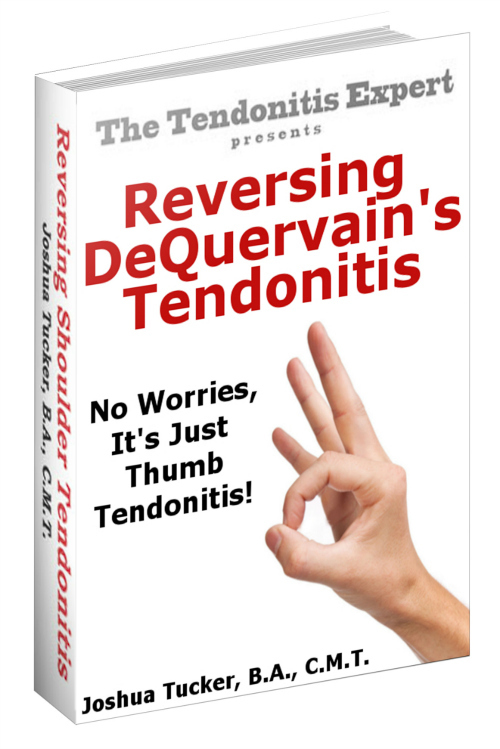 If that doesn't help/work, then it's the Reversing Wrist Tendonitis ebook for you. Comments for Strained tendons in left wrist Recurring injury for 6 months Struggling to make any progress! I have had 3 bouts of tendonitis, first was in 2009 with DeQuiverins tendonitis. After 3 shots of steroids in each hand that failed I had the surgical release in 2012 and 2013, which had caused nerve damage due to lack of use. The second was the standard tendonitis, which after an anencephaly amount of hand therapy and minamising my use of both hands it dissolved. Third is this year 2017, about 2 months ago I started to get the same pain as I had the last 2 times. I haven't gone the way of medicine this time opting for remedial treatment. I haven't had much grip in my hands since 2009, and each new diagnosis has found more arthritis in my wrist and thumb joints. I'm sick of not being able to do common things like signing my name or opening a bottle. So my question is, how would I stop history repeating itself again? 1. Tendonitis (history) doesn't repeat itself. It's either always getting worse (which may have ups and downs), or it's getting better (because you're doing something effective to reverse the causes). 2. I'm not sure what you mean, did you say the the DeQuervain's surgery caused nerve damage? 5. Osteoarthritis is a function of the tendonitis dynamic, all the tightness compresses the joint(s) and they grind and get inflammed. Remove the tightness, remove the cause of osteoarthritis. 6. Possibly a smart move, not 'going the way of medicine' this time. It hasn't helped you yet, and...it generally won't as 'medicine' ignores the actual causes of the tendonitis symptoms.